I haven't posted for more than a week and I already have a bad conscience. There were so many interesting things going on at CERN in the past two weeks, but i'm too busy now to write about it. But don't worry: i'm keeping my notes and my memories. I'll be back soon, stay tuned. Disclaimer: the title of this post is by no means alluding to the LHC. 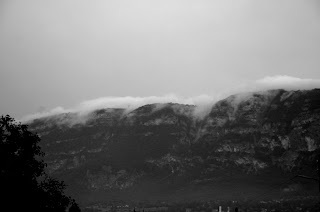 Last week the colour was dark. I don't mean my depression but a very interesting dark matter workshop that was hosted by CERN. Some of the highlights i already covered here and here. Several other talks deserve being mentioned. But, instead of doing my reporting duty, i'm going to offer you some reflections on the all important question: what is this elusive particle that accounts for one fifth of the energy density in the universe. 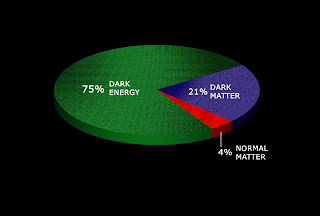 The particle that constitutes the dominant dark matter component should have several properties. It has to be stable. It cannot have an electric charge, otherwise it wouldn't be dark. It cannot have strong interactions either, otherwise it would bind to nuclei. Therefore, it cannot be any of the known particles (see here why it cannot be one of the neutrinos). We badly need a new particle. Here is where the cavalry of particle theorists comes to rescue. In fact, not much skill is required in order to come up with a dark matter canditate. The simplest possibilty is the WIMP, which stands for a weakly interacting massive particle. Take a stable particle with the mass of order the weak scale, that is 100 GeV. Assume its cross section for annihilation into ordinary matter is of order 1 picobarn, a typical weak interactions cross section. In the early universe, such particle would be in a thermal equilibrium with the photon plasma down to temperatures of order 10 GeV. At later times the annihillation would die off, leaving the relic density consistent with what is observed today. That was easy. Too easy. 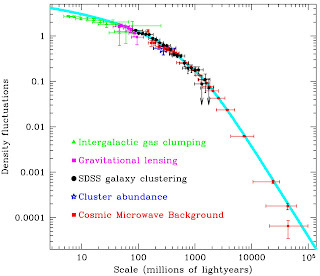 The flip side is that the literature suffers from proliferation of dark matter candidates. There exist thousands of models that yield a stable WIMP. Even worse, the WIMP is not the only option. Theorists know the tricks that allow to get the correct relic density for a particle that has never been in a thermal equilibrium. With this problem of plenty in mind, theorists aim at obtaining a dark matter candidate as a by-product in a model designed to solve some other problem. Such particle is sociologically upgraded to a motivated dark matter candidate. What are the motivated candidates? The most tempting approach is to explore the coincidence between the WIMP mass scale and the electroweak breaking scale. There is a hope that the underlying model of electroweak symmetry breaking could also explain dark matter. Indeed, models that try to solve the hierarchy problem often accommodate a dark matter candidate. Technically speaking, the connection arises as follows. A solution to the hierarchy problem always comes with a host of new particles at the weak scale. These new particles affect various low energy observables, which leads to a tension with experiment. One way to reduce the tension is to introduce a conserved parity symmetry, such that the Standard Model particles have the +1 charge and the new particles have the -1 charge. One consequence is that only pairs of the new particles can couple to the Standard Model ones, which usually helps to agree with experiment. Another consequence is that the lightest of the -1 charge particles is stable. Voila the dark matter particle. This strategy has been recently applied to the Little Higgs models. 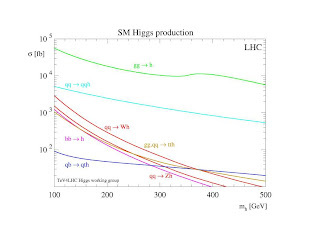 Little Higgs is a scenario in which the higgs boson is a composite state, with the compositeness scale of order 10 TeV. The separation between the weak scale and the compositeness scale is stabilized by designing an approximate global symmetry and making the higgs a pseudo-goldstone boson. The global symmetry requires new states at the weak scale, which affects the electroweak precision observables. The remedy is the T-parity: a discrete symmetry ensuring that the new states couple only in pairs to the electroweak gauge bosons. The lightest T-odd particle (usually, some new gauge boson) is stable and can play a role of dark matter. Maxim Perelstein gave a nice account of this scenario last week; i also recommend his recent review article. A similar story happened with supersymmetry, which used to be a well motivated candidate for new physics. Supersymmetry would immediately lead to a disaster by breaking the baryon and the lepton number, which would result in excessive proton decay. This time the remedy is called R-symmetry, and it assigns minus R-charge to all superpartners. Colliders. Massive, weakly interacting particles produced in collisions could leave missing energy signatures. Direct detection. A flux of dark matter particles going through the Earth could trigger a signal in an underground detector. Indirect detection. Radiation produced in dark matter annihilations could produce characteristic astrophysical signatures. The last point was discussed last thursday in a session led by Gianfranco Bertone. We were offered a beautiful survey of different strategies to observe a signal from dark matter in the sky. Although, on average, the dark matter annihillation rate is small today (obviously, dark matter is no longer in a thermal equilibrium), there could be overdense regions where it is large enough to produce a tell-tale signal. The observers thus turn their attention to the places where dark matter could clump: the galaxy center, black holes or the center of the Sun. How can we see dark matter? First of all, with our own eyes, or a slightly enhanced version thereof. By detecting photons. There are several ways dark matter annihilation can produce photons. First, dark matter could directly annihilate into a photon pair. This would produce a beautiful sharp line in the gamma-ray spectrum, at the energy corresponding to the mass of the dark matter particle. A smoking gun, indeed. The problem is that dark matter is dark and does not couple directly to photons. Any such process would proceed via quantum loops and could be too much suppressed. Therefore we should keep our eyes open to other signatures. Another process to focus on is the secondary radiation: decays of the annihilation products (pions, for example) into photons. This produces a featureless spectrum that is harder, but not impossible to distinguish from the astrophysical background. Finally, there is the final state radiation when charged particles produced in the annihilation radiate photons. All this is subject to active experimental studies. Our galaxy center was recently probed by the satellite gamma-ray observatory EGRET and the ground based gamma-ray telescope HESS. More accurate measurements in the 10MeV to 100 GeV band will be performed by GLAST, whose launch is scheduled for this autumn. The photon window is not the only one to look through. Much hope is put in neutrino experiments. Dark matter is expected to accrete on the centre of the Sun and annihilate into highly energetic neutrinos. Those can escape the Sun and be detected by neutrino telescopes like AMANDA or ICE-CUBE who can distinguish them from MeV neutrinos copiously produced in nuclear reactions. Positrons and antiprotons from the galactic halo could also be messengers of the dark side. The problem with astrophysics is that it is a dirty business. In fact, several experiments have already detected signals above the estimated background. 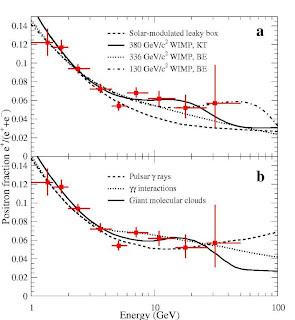 HEAT observed an excess of positrons at 10 Gev, see the figure. EGRET and HESS report an excess of gamma-rays from the galactic center. INTEGRAL sees a 511 keV line signifying a suspicious positron activity in the galactic center. These signals can be interpreted as a hint of dark matter (needless to say, different experiments point to a dark matter particle of different mass). But just as well they can be interpreted as a hint of complicated astrophysical dynamics that has not been understood well enough. Because of that, indirect detection will hardly ever be considered as an evidence for dark matter, unless a very clean signal is observed. 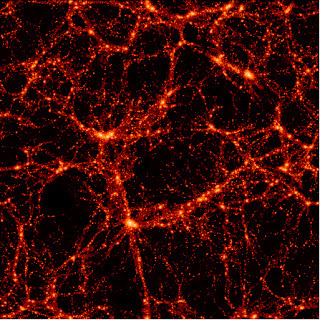 But combined with collider studies and theoretical models, it can provide important hints about the nature of dark matter and its distribution in our galaxy. There is a chapter on indirect detection in a Phys.Rept review by Gianfranco&co. tells that cosmology is sensitive to the sum of the neutrino masses. This is just perfect since the neutrino oscillations experiments are sensitive only to differences of the neutrino masses squared. Cosmology provides us with an opportunity to pinpoint the overall scale of neutrino masses! To achieve this we need to find the characteristic imprints that the cosmic neutrinos leave on large scale structures in the universe. 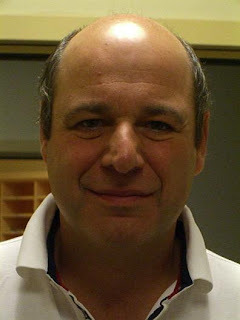 This subject was discussed by Julien Lesgourgues who knows everything about structure formation. His speech was easy and clear, even though his name could suggest otherwise. There was also a related talk by Steen Hannestad. Neutrinos are practically collisionless. As long as they remain relativistic they free-stream. This means they tend to wipe out dark matter perturbations at scales shorter than the free- streaming length. The latter is simply related to the relic neutrino energy density. Thus, by measuring the distribution of dark matter in the universe we can find out how much neutrino component it contains. which is only an order of magnitude away from the lower limit 0.05 eV set by the oscillation experiments. The future is bright for dark matter. New experiments will soon provide more accurate data (Planck for the CMB, SDSS-II for galaxy surveys). Weak lensing will tell us about the time evolution of the dark matter power spectrum (see the recent article about weak lensing tomography in Nature). All this will increase the sensitivity to neutrino masses down to 0.1 eV level. To learn more, there is a comprehensive review Julien made for Physics Reports. If you need something lighter to read on a train, take a look at this article by Steen. Somebody must have worried that one cosmo workshop is not enough time-consuming. So they kindly offered us a simultaneous academic training in the same domain. This week Dominik Schwarz will give a series of lectures on Particle Cosmology. I am too classical to be in two places at once and i have to regretfully skip this one. Even without my review you are welcome to watch the video recordings, as soon as they become available. The past trainings gave us an opportunity to admire dynamical, eloquent, American-style lecturing, see here and here. Fabio is certainly not of that kind. His style is more down-to-earth. He prefers enumerating facts to building a story. Too often, he chooses flicking through equations rather than clarifying an overall picture. Nevertheless, Fabio is a high-class specialists in higgs physics and this was showing several times this week. The lectures contain enough interesting material to be labeled recommendable. The first lecture concentrates on the theory of the higgs mechanism in the standard model. Many technicalities are included, which often results in overloaded transparencies. On the other hand, you get an opportunity to hear about less publicized topics like the custodial symmetry or the triviality bounds. In the second lecture Fabio plunges into extensions of the standard model higgs sectors. 30 minutes of precious time is squandered on the MSSM, which is a bit of a shame. 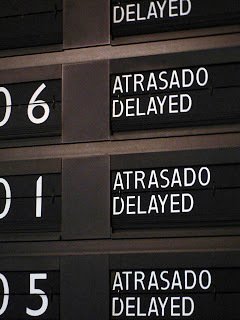 Alternatives are given considerably less time and are treated less fairly. If one accepts the minimal supersymmetry with all its fine-tuning burden, there is no reason to discard technicolor because of the electroweak precision tests. Both require a comparable amount of fine-tuning to satisfy the experimental constraints. The last, and the best part of of the lectures deals with the higgs phenomenology. The higgs boson production and decay channels are extensively discussed. Then comes the higgs physics program at the Tevatron and the LHC. We get a good overview of how the interesting signals can be extracted from the tons of junk produced in hadron colliders.